Sea Spi. Catch the Sea Spi at Carlisle Bay, Harbour Lights, Upper Bay Street, Bridgetown, St. Michael, 434-0207. Email seaspi@caribsurf.com. Sea Spi is a revolutionary electric, personal, whisper quiet watercraft. Operate the single or twin Sea Spi and through the bubble-free viewing glass you will be able to see the underwater world of Carlisle Bay, home to underwater wrecks such as the Cornwallis, the Bajan Queen, the Berwyn, the Barge and the Eillon, a collection of War vessels, freighters, and tug boats! Age participation is between 5 and 80 years old. Maximum weight restriction is 300 pounds per guest. Life vests are required and provided during your Sea Spi experience. Wear your swimsuit and don't forget your sun protection! Atlantis Adventures, toll free 1-866-546-7820. Experience the unforgettable undersea expedition of a lifetime on board the Atlantis Submarine where you will discover the natural undersea world of Barbados, seated in the comfort of this spacious, air-conditioned Submarine. Before returning to the surface, this state-of-the-art submarine descends to depths of 115 to 150 feet to view what has in the past been reserved for scuba divers only - a sunken shipwreck! Shasa Catamaran Cruises, 433-8274 or 423-8670. The Shasa Catamaran is a stunning 30 foot vessel catering to groups of up to twelve and offering free snorkeling instruction and unlimited drinks. 1. Harbour Master: - HMV Harbour Master takes you on lunch and dinner cruises, as well they offer private charters for weddings, birthdays, etc. 2. Note: This cruise is not currently available: Jolly Rogerfor "partying with the pirates:" - Once onboard this authentic woodenschooner, you can rope swing, swim and snorkel or suntan on the topdeck, and even get married (pirate style, of course) or plan your nextraid and plunder mission. Also available for private charters. 3. Tiami: Take a five star lunch or cocktail cruise or book a private cruise or book a charter for your wedding, birthday or any other celebration. Silver Moon Charters offers sailing, catamaran sailing & private sailing charters. Heatwave Sailing Cruises offers lunch, wet 'n' wild and private cruises, as well you can book a private cruise. 228-8142. Stiletto Catamaran Cruises, Bay St., St. M. 426-4043. Stiletto Catamaran Cruises offers lunch and Champagne cruises as well as private cruises. Carlisle Bay Centre, Bay Street, Bridgetown, 426-6101 or 427-4735. 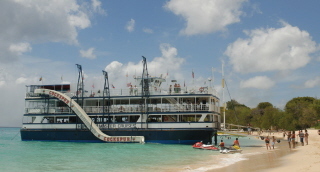 Carlisle Bay Centre with its Water Sports Center offers a trip aboard their glass-bottom boat to sail to the Berwyn wreck, and view the underwater scenery along the way. Snorkel in and around the wreck. Rubaiyat, The Careenage, Cavan Lane, Bridgetown, St. Michael. 436-6921 or 266-7878. Rubáiyát Catamaran Cruises specializes in sailing tours of the Barbados coastline - offering exciting cruises where you get to experience swimming with and feeding of friendly sea turtles or snorkelling. There are lunch cruises, sunset dinner cruises, three hour cruises as well as private charters... on a 50-foot long schooner.